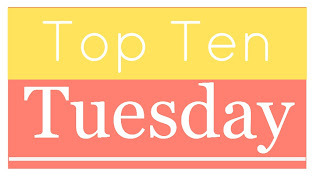 This week's Top Ten Tuesday topic from The Broke and the Bookish is a fandom freebie. I'm terrible at fandoms and I've been flailing around with topics for quite some time so I've decided that I'm broadening my focus, joining the general bookish fandom and these are the things I want to buy! 1. 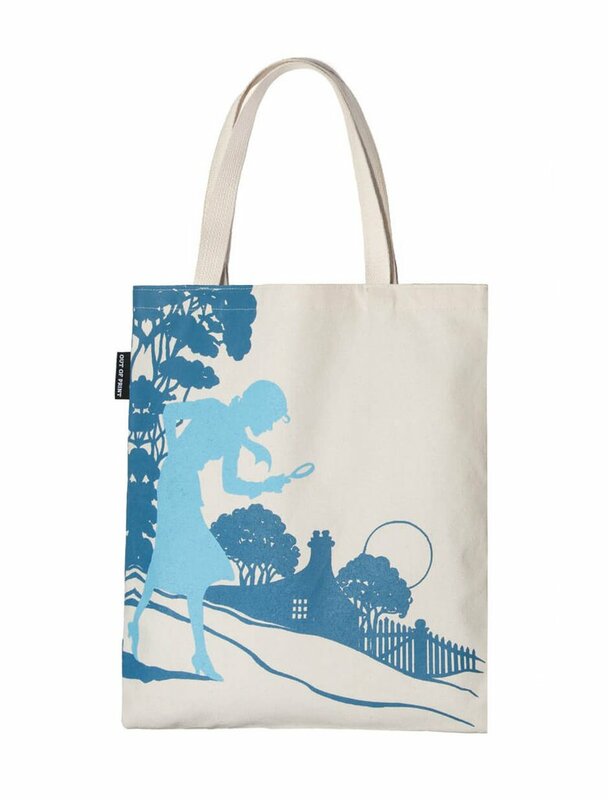 Nancy Drew Tote Bag from Out of Print - Because Nancy Drew is the best and all my tote bags seem to have disappeared. Obviously I need this Nancy Drew bag. 3. The Great British Bake Off Coloring Book - This way I can decorate all those glorious show stoppers without having to worry about having something fall apart or come out wrong. All I need is Sue Perkins and Mary Berry to hang out with and it'll be a pretty good night! 4. Literary Candles from Uncommon Goods - I'm thinking 221 B Baker Street (Black Currant Tea and Leather Books but Thornfield Garden (Roses and Rain Water) from Jane Eyre sound pretty good too. 5. 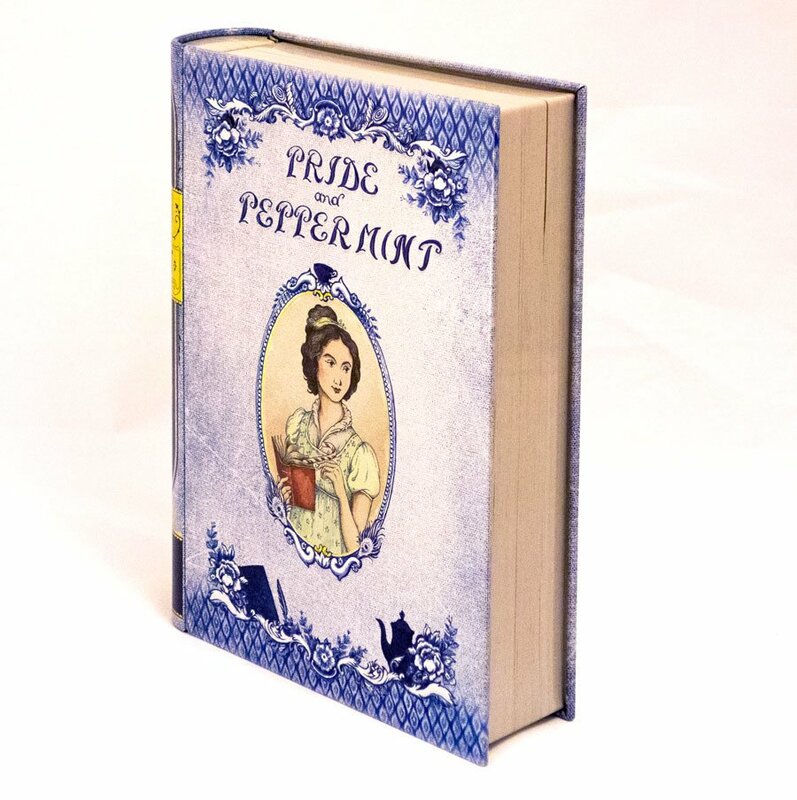 Pride and Peppermint Noveltea Tin - I so adore this idea. While Pride and Prejudice isn't my favorite book (but I'm not sure I'm want any Agatha Christie inspired tea. I guess it'd be almond flavored?) but the tea sounds amazing and the tin is amazing! 6. Library Card Mug from Out of Print - Since I"m making bookish tea I need a good bookish mug and this one matches my phone case so wins all around! 7. This Bookish Blanket from Cafe Press - Now that I have tea I need a blanket to snuggle down with! If I'm sitting for any length of time I get cold and I must have a blanket! I love this bookish blanket! 8. 5 Year Journal - I saw an idea on Modern Mrs. Darcy about using a 5 year journal as a reading journal and I love the idea. I've kept a reading journal for years but it's more of a date started, book title, date finished type thing. This would be just the title of my primary book and maybe a short thought so it wouldn't get overwhelming and I think it'd be fun. 9. Nancy Drew bookmark - I love the old Nancy Drew covers and these bookmarks from Somekindahwonderful over on Etsy are amazing! I don't read all that many books in print but can you ever have too many bookmarks? 10. Lots and lots of reading time! - This one can't be bought but it's probably the thing I want most! What do you have on your bookish shopping list? I love that Nancy Drew tote!!! I have to check out the Great British Bake Off coloring book!! This is a fun twist on the topic! I like the Jane Eyre shirt especially well. I like the direction you went with this topic, Katherine. I love that tote! Now I want one too. I grew up reading Nancy Drew books--and I know my mom did before me as well. More reading time would be so nice! Great list, Katherine. I love the library mug. I *MUST* have the Nancy Drew tote bag and bookmarks!! These are fantastic! What a fun topic! I love the Nancy Drew tote bag. That's great. I love your twist on the topic! The Nancy Drew tote is awesome! I LOVE your list, Katherine. Many thanks for sharing...:) Though perhaps I'll pass on the almond flavoured tea! These are pretty awesome! 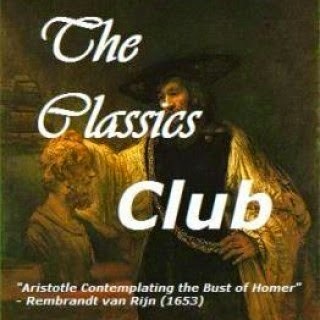 I need to check out (or stay away from - depending on how you look at it) Out of Print. I have almost bought some shirts from Lithographs which are cool since the pictures are made out of the text of the book which I think is cool. I love the Nancy Drew tote! I love bookish things, I like bookish cushions etc, bookish cards etc. Mostly I want to make a bookish quilt some time. What a great idea! For some or other weird reason, bookish thingies are not very big in South Africa. Nope, I also don't know why! I need to go and have a look at Out of Print - some great things on there. Would LOVE an Agatha Christie t-shirt!!!!! Nancy Drew... Please don't hate me forever and a day now, but I have NEVER read Nancy Drew. I have a bit of reading time today, so I think I might quickly get one and see what it is all about. I'd want the library card mug! Such a hard topic! Love the Nancy tote. So cute! That tote is amazing. Nancy Drew was my first read ever and my first fandom! And I so need to check out the 221b candle...sounds heavenly! I'm thinking I need that Nancy Drew tote too!